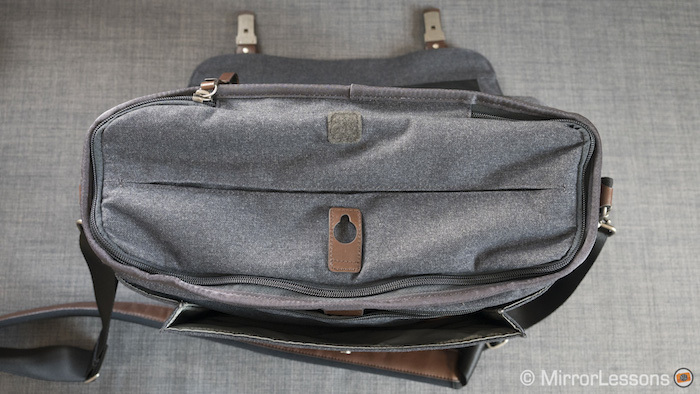 A few months ago, Think Tank Photo announced its Signature series of shoulder bags and we’ve had the good fortune of being able to test the 13-inch version almost from day one. In contrast to the more rugged Retrospective series, Signature places equal importance on functionality and fashion, making it the ideal choice for anyone who works in an urban or corporate environment. 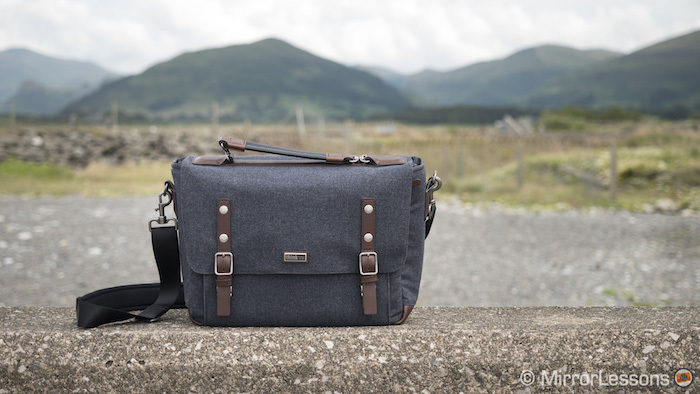 If you’ve been looking for a new camera bag, we suggest you keep reading: there are lots of good things to say about this new series! Ethics statement: the bag was sent to us to conduct our review. We were not asked to write anything about the camera, nor were we provided with any other compensation of any kind. Within the article, there are affiliate links. If you buy something after clicking the link, we will receive a small commission. Don’t worry – prices remain the same for you. To know more about our ethics, you can visit our full disclosure page. Thank you! 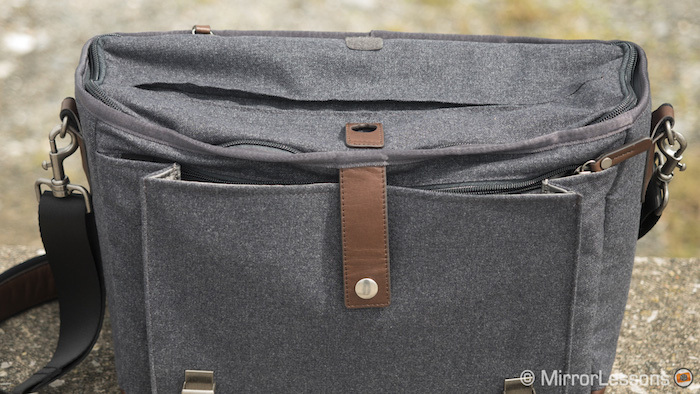 Think Tank always places a lot of importance on the design of its bags, but none so much as the Signature series. The first thing that catches your attention when you see and hold the bag for the first time are the premium materials from which it is made. It is covered a modern nylon-polyester blend that almost feels like soft wool to the touch and in the three months we’ve been using it, has proven very durable. Because it is water repellant, the bag can stand up to light rain but you may want to use the provided rain cover for extra protection during heavy downpours. In key points around the bag, such as the closures and the attachments for the straps, you’ll find a number of neatly stitched leather accents which add an elegant touch to its appearance. 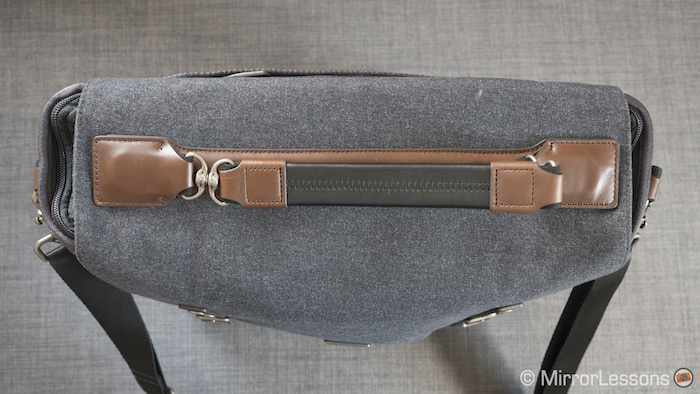 Think Tank opted to cover the base of the bag in leather too, as it is more durable than the nylon-polyester blend used for the rest of the exterior. Its stylish appearance is best suited to an urban environment and formal settings but that doesn’t mean you can’t use it in more rugged environments as well. 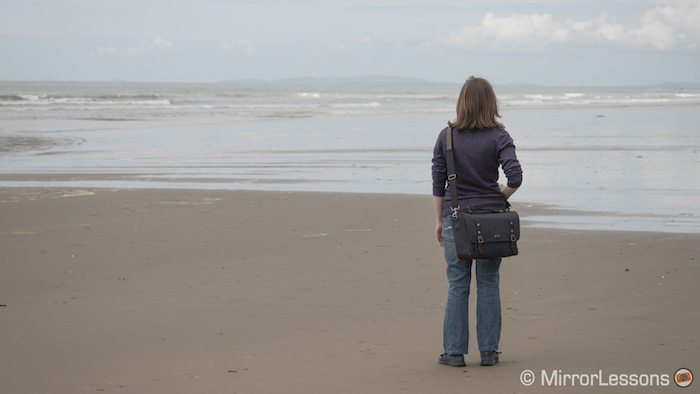 We mostly used the bag in rugged environments as we live in rural Wales! 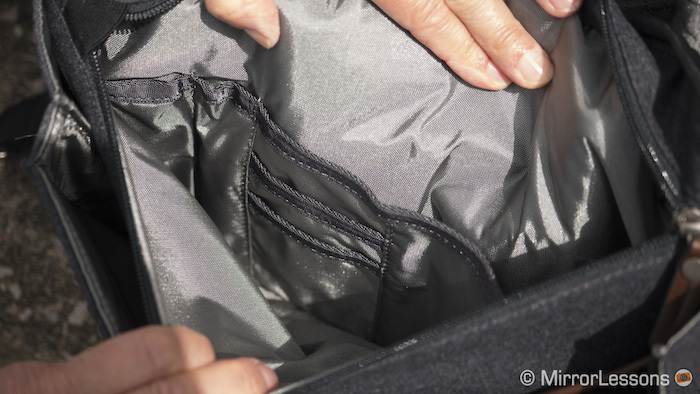 The entire inner compartment is quilted, meaning that as long as you separate your gear with the provided dividers (which are also quilted) there is no risk of your gear getting scratched or damaged. The bag comes in two sizes (10 and 13 inch) and two colours (Slate Grey and Dusty Olive). The 10-inch version can only fit a tablet whereas the 13 inch version can house a 13″ laptop like the MacBook air. Both sizes are suitable for mirrorless gear but you’ll obviously be able to fit more inside the larger version (more on this below). 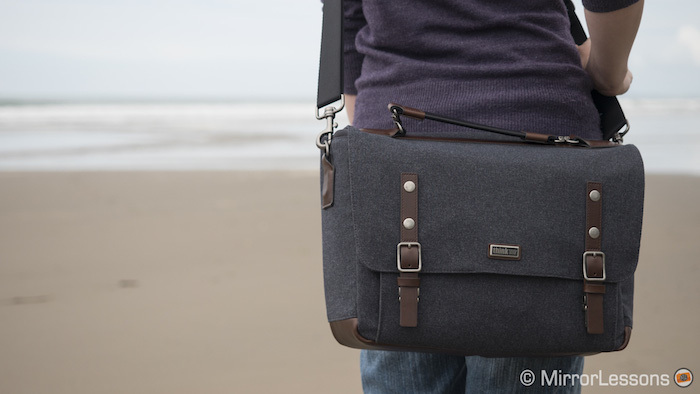 The bag comes with a shoulder and hand strap, a main compartment with four dividers, and five large pockets. It is difficult to find a real flaw given the amount of gear you can fit inside. 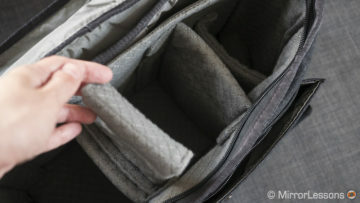 The main compartment is where you can store your cameras and lenses. We already mentioned that it is quilted, so your gear is fully protected as long as the dividers are in place, and it is sufficiently roomy to house a mirrorless camera with a standard lens attached and 2-4 additional lenses depending on their size. The dividers have been designed so that you can fold them to create shelves for smaller gear such as prime lenses. You can also fold back the velcro edges, which is useful if you want to quickly lift the divider to access gear that is located near the bottom of the bag. 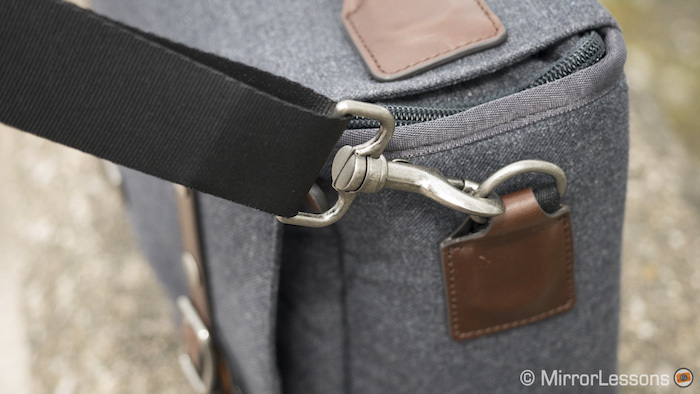 …you can create a hinge-like mechanism that opens and closes, letting you access gear at the bottom of the bag. There are two ways to close the main compartment depending on the level of protection you need. 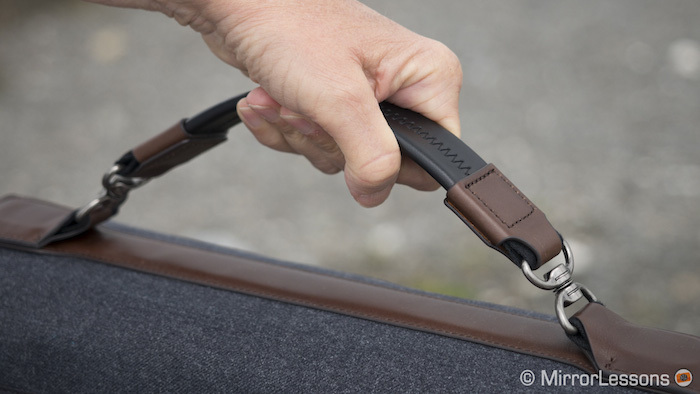 The more secure closure requires a two-step process: you zip the floppy cover closed, pull the main flap over the top, and lock it in place with the two buckles on the front of the bag. 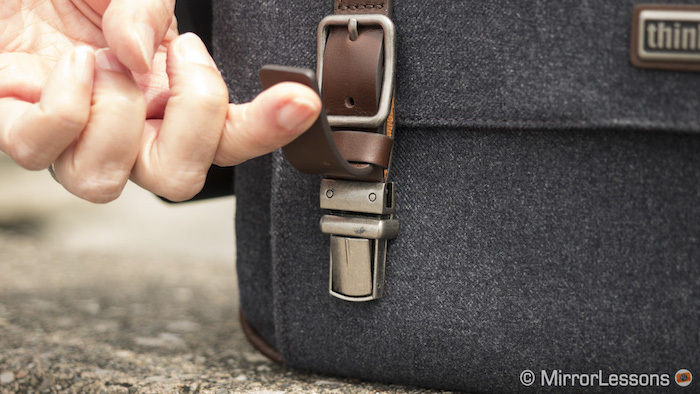 By closing the bag in this way, your gear is safe from sticky fingers and the elements. …with the buckles on the front. If you frequently need to open and close the bag to access your gear, however, you can remove the floppy cover from the equation altogether. 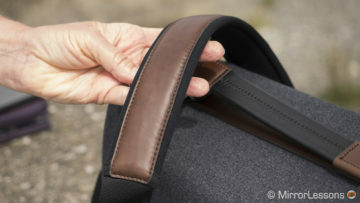 This is done either by storing it inside the dedicated pocket located at the back of the main compartment, or attaching it to the leather button on the underbelly of the main flap. Store the floppy cover inside the dedicated pocket so that it’s out of the way. 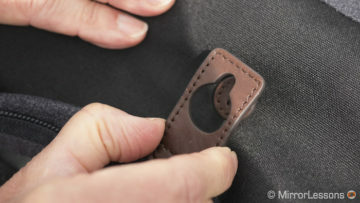 Attach the floppy cover to the main flap via the leather button. The only thing I don’t like about the second solution is that the main flap on its own isn’t long enough to cover the entire width of the opening. If you don’t zip the floppy cover closed, gaps appear on either side, exposing your gear to the elements. 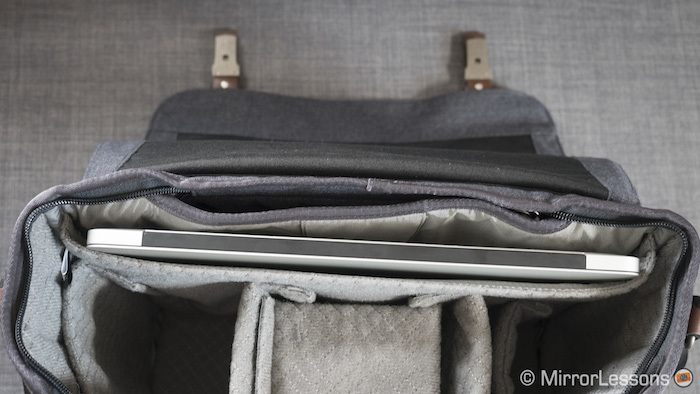 This is especially true if you insert a 13-inch laptop, as it stretches the bag to its full width. When the floppy cover is zipped close, there are no gaps. When the floppy cover is packed away, there are gaps on either side. 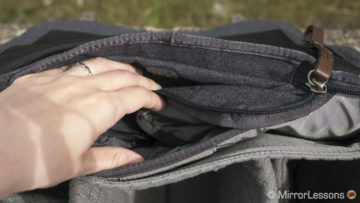 As with all Think Tank products, there are plenty of pockets that can be used to store gear, accessories and documents. The largest pocket is found on the front and can expand or contract according to the amount of gear inside. It is also the least secure as it can only be closed via two buttons on the front. For this reason, it is best to avoid using it for valuables such as your keys and wallet – although there is a dedicated slot for a mobile phone that is quite handy. I personally find this pocket suitable as a temporary storage place for accessories I need quick access to such as lens cleaning cloths or filters. 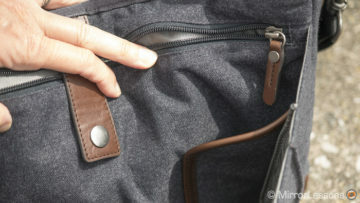 Directly behind this pocket is a second flat zipped pocket with a number of small compartments for anything from memory cards and batteries to pens and business cards. 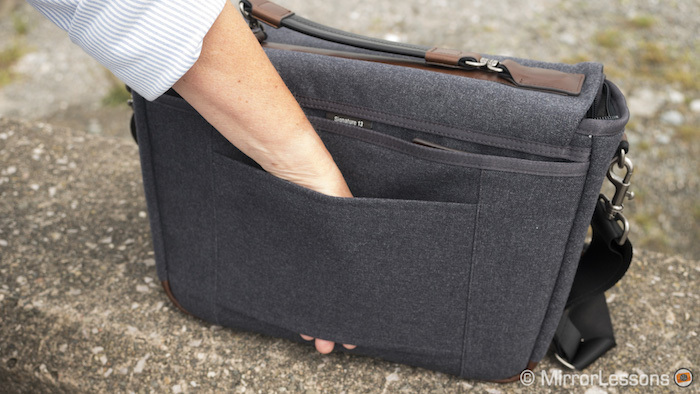 Turning to the inner compartment, we find two additional pockets: one that can house a device as large as a 13-inch laptop and another to store the aforementioned floppy cover when it’s not in use. 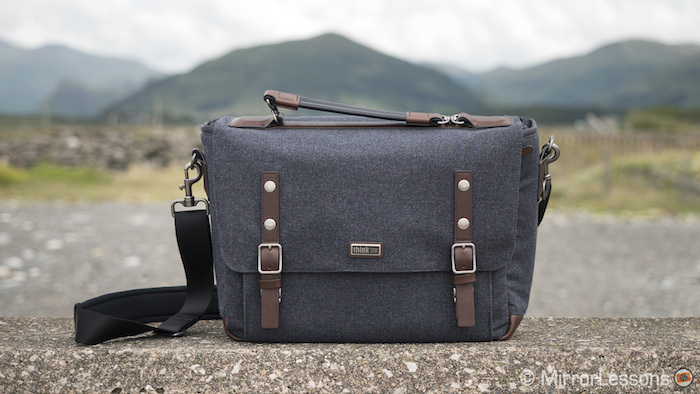 Now, to say that the first pocket can comfortably fit a 13-inch laptop is, in my opinion, something of an exaggeration because it is a very tight fit if you are carrying around anything more than a camera and lens or two. What’s more, it can render the back of the bag very rigid. It’s fine if you only use the bag transport your gear from point A to B inside a vehicle but it’s less comfortable if you often carry the bag around on your shoulder. The final pocket is found on the rear. It too is a flat zipped pocket and is ideal for documents, manuals, or any other flat item you might be carrying around. Were I travelling, this is the place I’d most likely put my passport and boarding pass, as it is both secure and easy to access. 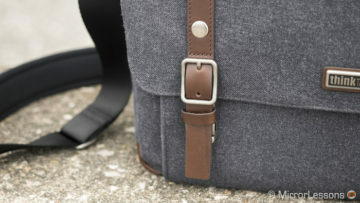 The only pockets I feel are missing are the external ones found on either side of other bags in the Think Tank range, such as the Retrospective (see picture below). 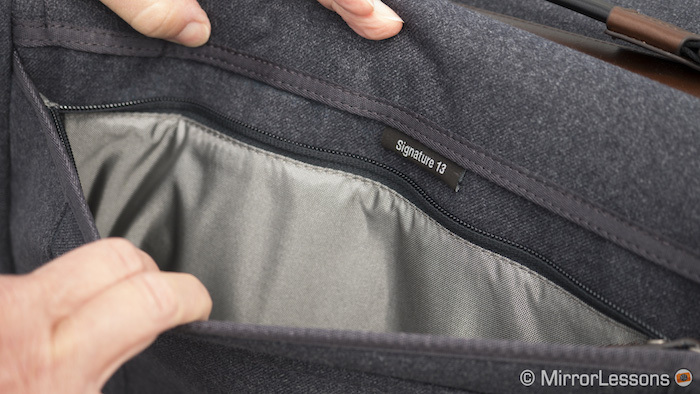 The Signature could do with the same external side pockets found on the Think Tank Retrospective. Of all the features of the Signature, the shoulder strap has to be my favourite. In addition to being beautifully padded with neoprene, it also features swivelling snap-on clips that prevent the strap from getting tangled or twisted. 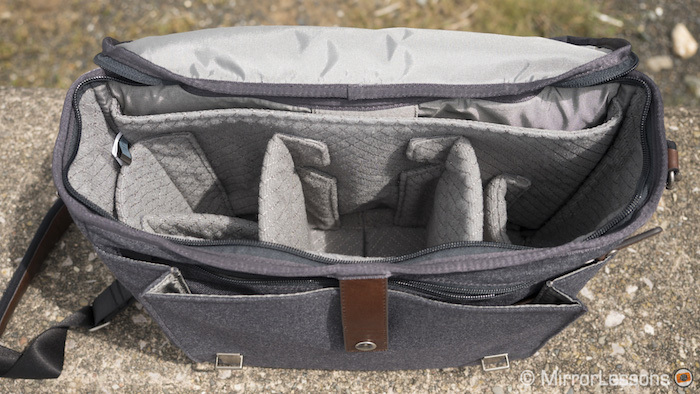 Unlike other Think Tank bags whose padding attaches via velcro and slides up and down the seatbelt-like webbing, the Signature’s padding extends along most of the strap. 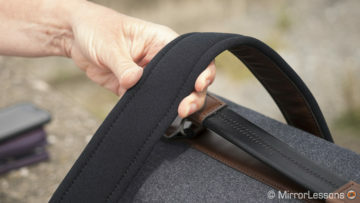 It is also very easy to adjust even when wearing the bag over your shoulder. The hand strap is also well-made and features a similar set of double swivel attachment points that give it some extra flexibility. It is very comfortable to hold and is made entirely of leather. Finally, if you’re pulling around rolling luggage, you always have the option of sliding the Signature over the handle thanks to the pass-through on the rear. As with the majority of our bag reviews, we’ve put together a practical example of how much gear you can carry inside the Signature 13. We’d only recommend packing this amount if you mainly use the bag to transport your gear from one location to another inside a vehicle. 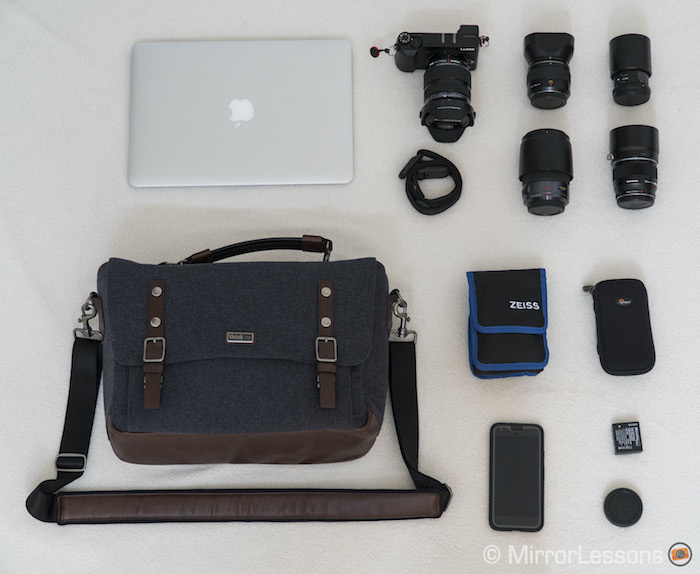 If you often carry the bag on your shoulder and reach for your camera and lenses while on the move, it could be a good idea to remove a few of the items we’ve shown here – particularly the laptop as it can weigh you down after a while. 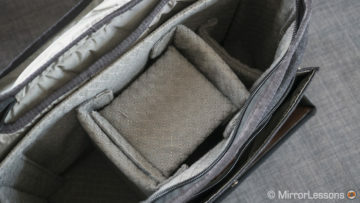 The bag doesn’t work quite as well with big lenses such as tele-zooms or large primes for the full-frame Sony E-mount. The reason for this is that you’d have to remove most of the dividers to lie it flat inside the bag, leaving little room for other items. Even inserting it vertically can be problematic if the lens is longer than the maximum height of the bag because you won’t be able to close it properly. 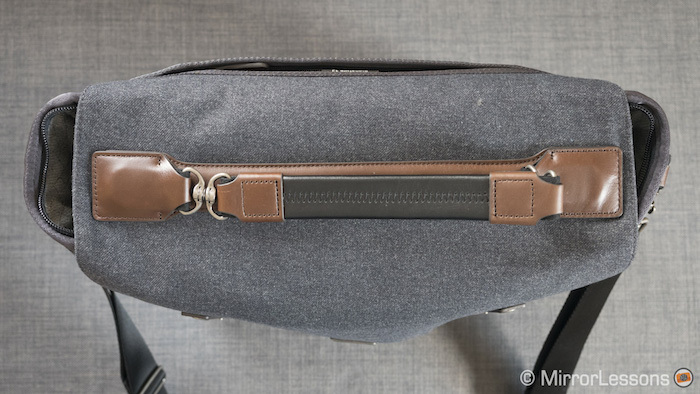 Think Tank has once again hit a home run with the Signature series by providing photographers with a near-perfect medley of comfort, functionality and very careful attention to detail, materials and appearance. 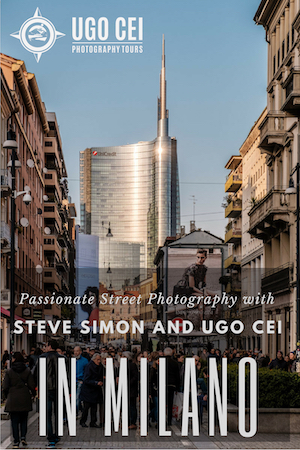 While the target audience is most definitely photographers who work in an urban setting, the materials are sufficiently resistant that it can also be used in more rugged environments as well. There are only two things I’d change about the bag. First, I would make the top flap a little longer on either side so that it covers the entire opening to the main compartment even when the floppy cover is stored away. 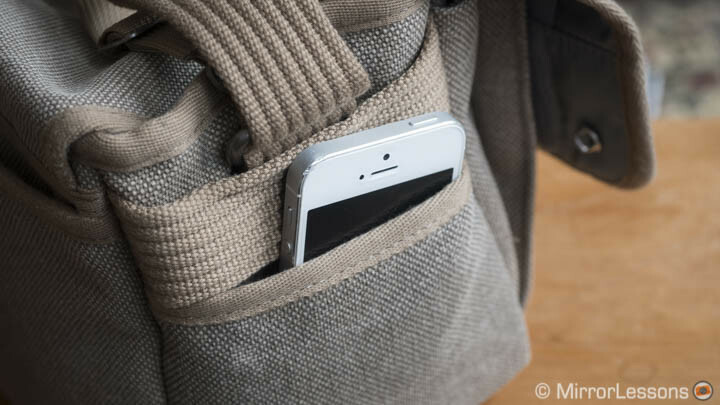 Second, I would bring back the side pockets found on other Think Tank shoulder bags as they are very handy for storing accessories. Otherwise it is an excellent choice for any photographer looking for a bag that is as fashionable as it is functional.